Entrepreneurs don’t often think of themselves as leaders. Thinking like a leader will help you think bigger and step into creating the impact you want on your community and in the world. When you think of people like Elon Musk, Richard Branson and Oprah Winfrey, do you really think of them as business owners? They are leaders. There’s a latent leader in you waiting to come out! Within many languages, there are accents. 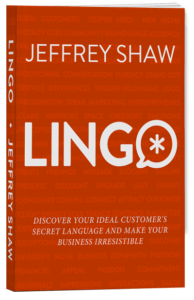 Similarly, when you speak the lingo of your ideal customers, there are different personalities. So while you want to attract and appeal to the narrow audience of ideal customers, you can also appeal to the broadest segment of ideal customers as possible by understanding their different personalities. Learn specific strategies to do just that on your website. There are many business models based on a frictionless experience for the customer–rideshare apps, food delivery, etc. In this episode, I reverse the thinking. How about as businesses we concentrate on attracting frictionless customers? Those that are the easiest to work with. Those that make every day a pleasant working experience for you and your entire company. What makes a frictionless customer? Alignment. Listen in and you’ll find out how. Are you allocating your time towards what you say you value? This episode will prepare you for the next episode with Steven Griffith who offers strategies to do a time cleanse. By doing a time cleanse, you can create the time to really put your time towards what you value. Note- it seemed fitting to use this photo of me with my two dogs because my dog Milo, on the left, is very ill and I don’t know how much time I have left with him. I value my time with him. I’m fortunate to have many conversations in a single day with a diverse group of people in person and online. I’m always looking for connections between conversations as an indicator of what the world needs or how people are evolving. I’ll bet you’ll relate to one or more of the random thoughts shared in this episode and you’ll learn about the importance of movement. And how conversations create movement. My good friend, Melissa Smith happened to be visiting me in Miami so in this episode, we chat about resistance to getting help and the different types of support you need for your business. Melissa is an expert in remote work and virtual assistants and perfect for this conversation. The bottom line is this. You can say you can’t afford to get help. The truth is, you can’t afford not to and entrepreneurs need to stop kidding themselves. There are so many of us driven to do big things in the second-half of our lives. Feeling driven with a strong passion combined with impatience can be frustrating. What I’ve realized along my personal journey and in speaking to others is that some fundamental feelings in our lives may need to be looked at differently in order to succeed as a mid-life entrepreneur. We Warriors are wired to work hard. Say that 10 times fast! :) That’s true in business and often in life. I wonder, though, if it’s how we should be showing up in the world. I wonder if the world wants a different way. Is it really how we get what we are striving for? My sense is that there’s a new way of being arising. A way to get all we want out of our lives without it being so hard. Come explore this idea with me. A month into the new year, how are your goals going? In this episode, I share a new way to set goals and structure your year. A way that I believe accomplishes the balance between setting your sights on big dreams while also taking care of yourself and avoiding disappointment and self-criticism. With this balance, you are more likely to achieve your goals! Some new thoughts on the classic phrase, “What got us here won’t get us where we want to go.” Perhaps it has more to do with old ways of thinking that are holding us back rather than adopting new practices and habits. I also share some thoughts about collective consciousness and manifestation.